I absolutely love training and teaching Xinyiliuhequan, but I have simply not been able to gather together a large enough, sustainable group of students over the past several years. I cannot stress enough how wonderful (and patient) the owners of Crossfit Taranis have been over the past couple of years as I have tried to gather a group of students. Both Reed and Vanessa are incredible people - they exemplify strength of both mind and body. They are inspiring! After much thought and reflection, I have decided to put my attempts to teach group lessons in Victoria on indefinite hold. At first I was somewhat saddened by this, but I have come to realize that the reasons are multifold. For one thing, it is currently the age of Mixed Martial Arts (of which I am actually a big fan). It is hard, however, for Xinyi to "compete" with MMA in terms of recognition and excitement, and "sexiness" - let alone with the free advertising provided by watching, for example, the UFC. It has been hard enough, over the years, to even compete with the "brand recognition" of arts such as "Karate", "Tae Kwon Do", "Tai Chi", etc... It is amazing to live in an age of seemingly limitless choice and options! But, it also means that a rare art like Xinyi can easily become lost in the shuffle. My own commitment to the art (and my dedication to my late Grandmaster Yu Hua Long) will also not allow me to overly simplify it or overly "sell" this art. I have never had to try to earn a living teaching Xinyi, so I have, perhaps also charged too little for my teaching... It is phenomenally dear to me but I want to share it (and I have always been willing to do so very affordably). That said, I don't want to spend my efforts selling and convincing all the time. Xinyi is one of the great treasures of traditional Chinese martial arts. It should go without saying, but that is not how advertising works. It is also the age of "Busy-ness". This, combined with limitless choices, seems to conspire against attracting students interested in learning a very ancient, traditional martial art - particularly one that requires some significant persistence and dedication (particularly during the first few months) to get good enough at to become intrinsically motivated (often then by the sheer pleasure of practice) to train away at it for the long haul... In true "gong fu" fashion, this art is both incredibly complex and deceptively simple. It takes a significant amount of hard work up-front - and then it is about ongoing, lifelong improvement. Such is the way of "gong fu". Such is the point of a "gong fu" approach applied to martial arts or any other aspect of life. Of course, I have definitely succumbed, at least somewhat, to the "age of busy-ness". I have my professional work in health care. I have my Master's degree courses which are quite challenging and time-consuming, particularly as I have dedicated myself to excelling at them as best I can. I also have a wonderful wife and a beautiful (albeit extremely busy!) baby boy. I have not had the time or energy (or surplus funds) to do the demonstrations, advertising, and almost constant salesmanship that, I now know, would be required to get enough people in the door in order get a large enough group together to dependably run a full-size class. Also, because I work with (quite challenging sometimes) children in my professional life, and I now also have a young child at home, I have not been particularly interested in teaching Xinyi to children - despite the fact that this may be the best way to find a new generation (and their parents) who are interested in learning an art that is so traditional and can be a tool throughout life (and which could be so naturally adapted for children). Perhaps in a few years as my little guy gets older he may be interested in learning Xinyi. Perhaps also, by then, I will no longer be in a direct-care role in health care and I will be missing working with children. That may be the time to offer Xinyiliuhequan classes to various age groups (as up till now I have basically only sought adult students). I am quite at peace with my decision - and it has been at least a year in the making. The most ironic aspect of all of this is that my own training and Xinyi has never felt better! While it is so helpful to have students (both to teach and train with) to improve one's own skills while teaching, the countless hours I have spent the past few years (most often on my own) training week in and week out have honed my movements and continued to internalize the art within me. At 40-years-old I have probably never been fitter and never felt so integrated in terms of mind-body-spirit towards my purpose and goals. I bring my Xinyi and my "gong fu" approach to a wide variety of activities. This not to say that I, in any way, have it all figured out (! ), or that aspects of life are still not a struggle sometimes, but it is to say that I am much more accepting of the fact that this is all a journey and that I know, at least better, some of the importance of accepting the classic "wherever you go, there you are". I do hope to try teaching Xinyi classes again in the future, but I'll just have to wait and see. My own training continues and I have never loved, or appreciated the art more than I do right now. It keeps me healthy and grounded and connected to the past (my own past and the ancient past) and the present - and it is part of what gives me strength moving into the future. If anyone is interested in arranging private or semi-private lessons (e.g. one-to-one adult; or, a couple of friends interested in training together; or, a parent-child combo, etc.) I would consider it. I am also open to offering a class at a workplace setting (or a club/gym/etc. where I come and teach the class but someone else is responsible for recruiting/assembling it). For now, however, it will be up to anyone interested to contact me to arrange something - as I need to put my efforts into my professional, academic, family, and training commitments (and not into recruiting students). There is an old expression, "When the student is ready the teacher will appear." For the time being, I rest assured that "The teacher stays ready for the students to appear." I wish everyone the very best on their path and in their pursuits. Learn, train, play, laugh, and get fit in 2016! I am still trying to find students who would like to learn one of the world's greatest martial arts - Chinese "Xinyiliuhequan" (Heart and Mind in Six Harmonies Boxing). I have been training in (and teaching) this beautiful, accessible art for going on 20 years, now, and I would really love to find students to share it with, and train with, in Victoria. For about $5/class you get pretty much private / semi-private (small group) lessons in an incredible art. I hope to encourage anyone who would like to come and sample some kung fu this year to check it out. Please see the "schedule and location" tab on my blog (www.sixharmonyconsulting.com). And, please share with anyone you think might be interested! I know that I have a lot to share with interested students. It is certainly my mission to cater my teaching to what people want to get out of martial arts and how they want to use martial arts to enhance their mental and physical wellness - not just in the gym but out into their daily lives. As there are a few classes this July that I need to cancel due to summer vacation and commitments - I would like to offer a special deal to anyone who would like to come and try out a bit of Xinyi in the next few weeks. For the month of July you can come and drop in at class for $5 per class (!). That way, this month you can try out Xinyi as a drop-in as many times as you like at a very low rate (i.e. the low per-class-rate you would normally get only for paying for a whole month up-front). I hope this encourages anyone who would like to come and sample some kung fu this month to check it out. Please check the "schedule and location" tab to see which classes are available this month. And, please share with anyone you think might be interested! I finished a project I called "100 Days of Xinyi" on September 23, 2014. 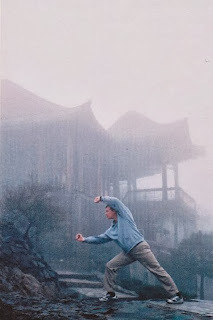 Over the course of 100 consecutive days, I wrote one hundred posts regarding my reflections on training in Xinyiliuhequan, martial arts more generally, and the intersection of martial arts and day-to-day life (a topic that is of the utmost interest to me). Please check it out. I have included a "Table of Contents" in hopes of allowing people to be able to scroll through the postings and dive in anywhere. Thinking about improving your mental, physical, and spiritual well-being? Xinyiliuhequan is a traditional type of Chinese kung fu. It is considered an "internal martial art", related to others such as Tai Chi (aka Taiji), and Ba Gua. One of the things that makes the Xinyiliuhequan style so interesting and accessible is that it is so practical and straightforward to begin learning. Right from learning your first move, you will both know that you are learning a genuine martial art and also feel you are getting a great, holistic workout. As accessible and approachable as first learning Xinyiliuhequan can be, because it is an "internal" art there is no end to the levels of learning and improvement that one can aspire to with dedicated practice. Once you learn a move or form it becomes like a container - to be continuously filled with other practices from Xinyi and whatever unique strengths and attributes you bring to your training. Thanks to the diversity of the "10 Animals" (and many variations of their movements and forms), concepts such as the "Six Harmonies" and the "5 Elements", and training principles such as the "Seven Fists" - there are always way to keep challenging and interconnecting one's developing skills. Also, when studying a traditional art like this it is always important to explore ways one might apply it both to "martial" situations - and to the challenges and stresses of day-to-day life. What Should You Expect When Attending a Class? When you come to train with me you should expect to be treated with respect. I always try to teach all of my students the essential fundamentals of Xinyi, but also cater the instruction and emphasis towards each individual student's particular hopes and needs. I am passionate about martial arts and about applying them to wellness and daily life. -learning specific variations of the ten animals (Bear, Tiger, Horse, Monkey, Dragon and Eagle, Rooster, Swallow, Hawk, Snake. I always enjoy training with my students whenever they can make it out to train. Although I wish everyone could come out and train twice-a-week, I fully understand that, as they say, "life can get in the way"... For that reason, students are welcome to pay by-the-class (if they can only make it once-a-week or less often) or by-the-month (for those who plan to attend most classes in a month). That said, I am dedicated to making this art accessible to good, kind people who want to learn an authentic, serious martial art. I never want people to feel bad if they miss a class. I also want people to feel accepted and to have fun. I am happy to train with people whenever they can make it out to train and I am always willing to train with people wherever they are at in their discovery and experience of this beautiful art. Please check out my previous blog postings for more information regarding Xinyiliuhequan and my take on martial arts practice. Of course, if you are interested please contact me via email. Let me know you are interested and then you are welcome to come and try out a session for free, of course! To learn more about my take on martial arts, please check out the "Home" tab for some suggestions of where to start. I am also always happy to hear from people who are interested in learning more. Six Reasons to Practice "Heart and Mind In Six Harmonies Boxing"
I once had a university classmate ask me a simple question years ago: "You seem to be in good shape. I'm not. What do you think is the best form of exercise?" What I wanted to say was - "Xinyi!!!" However, I answered much more broadly and realistically - based on my readings, my formal education, and my experience - "The best form of 'exercise' is a physical activity that you actually enjoy doing, that you will be motivated to do on a regular basis, and that you will actually diligently carve out time to do." For me, this has been practicing martial arts for over twenty-five years - and practicing, studying, and teaching Xinyi for the past fifteen. When life is good, I feel energized and practice Xinyi. When my body is achy, I take care of it by practicing Xinyi. When I am stressed, I relax by practicing Xinyi. When some horrible tragedies struck in my life a few years back, I was able to recover my physical, mental, and spiritual balance in part by - surprise (!) - practicing Xinyi! I sincerely hope that everyone can have practices in their lives that they can regularly turn to for day-to-day wellness - as well as for dealing with the inevitable hard times that will occur (and there are many practices out there (from Yoga to Hockey to Ballroom Dancing...) - so whatever works for someone, I am in favour of!). For me, that has been, and continues to be, Xinyi. "Gong fu" is literally "skilled work". It is striving for improvement and mastery through repeated, thoughtful, dedicated practice. It is alluded to in the words of ancient scholars like Lao Tzu's, "A journey of a thousand miles begins with a single step". Gong fu in China does not just refer to martial arts. It refers to any practice which a person has put in the time and effort to improve. There is "gong fu tea" which is serving tea with this approach. There is "gong fu calligraphy" taking years of study and practice. And, there are "gong fu" doctors, teachers, parents, engineers, etc... A person has "gong fu" when they have put in the time and effort to go beyond the basics and the minimal requirements - transforming an ordinary practice into something extraordinary. Gong fu requires "willpower" - and one develops willpower through practicing something diligently. Dr. Roy Baumeister in his brilliant book, "Willpower: Rediscovering the Greatest Human Strength", reviews and discusses some amazing, modern research regarding how to develop and "rediscover" the benefits of willpower. Of course, practitioners of gong fu don't need to "rediscover" this strength - it's what gong fu has always been about! It's how people can strive to be excellent at whatever they choose to do. Learning gong fu (and willpower) in one realm of life can help to develop this strength to apply it to other areas. Of course, gong fu also teaches humility and relaxation. I have, gradually, learned that I can do, and enjoy, many things in my life without having to be "gong fu" and "gung ho" at them all! Learning balance and moderation and long-term sustainability is as much "gong fu" as is trying to be able to do some things with full intensity. Now, before anyone jumps on me for claiming that Xinyi is the "best" martial art, or that I think violence to deal with violence is always a good thing, or that an ancient martial art has a chance against modern tools of violence, etc., etc... please hear me out. Knowing how to deal with violent people does not necessarily mean using Xinyi (or any traditional martial art) to physically defend oneself. Xinyi is a complete martial arts system. That means that it is not just for dealing with someone attacking you, but it means being healthy and making healthy life choices. It is about surviving and thriving. It means, for example, avoiding places, when possible, where violence is likely. It means understanding when, where, and how violence is likely to ensue. It means knowing when to fight and when to run. It means having a "flexible response" to violence - and to any of the challenges of life. One reason for having ten animals (and multiple movements for each) in the Xinyi repertoire is not just to create lots of interesting, diverse movements for personal expression and exercise (although that is pretty cool...), but more importantly to create options and infinite combinations for infinite potential situations. These options are not just physical, but psychological. If you are grabbed/seized, then you can use the physical aspects of "snake" to twist free, to grab/wrap back, to strike, etc. Much more common in day-to-day life, however, are opportunities to respond flexibly when you are "seized" by stress (be it physical or psychological). Through training, you have a variety of tools and models as to how to spiral out of the situation, to "advance by going sideways", to change course but then return to your path, etc... This might mean everything from staying safe in traffic to staying cool when work demands increase. The chance that most people who ever learn Xinyi will ever have to use it for violence are very low. Chances are you will never need to use Xinyi in a physical confrontation in the modern world, but it is a foundation of confidence to know that you can access your own inner strength if you needed to protect yourself. All the better that Xinyi practice protects a person every day by strengthening mind, body, and spirit. We supposedly live in an interconnected world... so how come so many of us so often end up feeling so disconnected? Of course, Six Harmony Xinyi is, quite literally, about "connecting", combining, and harmonizing. Connecting the heart and the mind. Connecting courage with intentions. Connecting the body and mind through movement. Connecting the breath with the movement. Connecting our thinking, rational mind with our animal, instinctive inheritance. Harmonizing our behaviour in the world by coping with the world as it is and creating the world as we want it to be. Striving for internal and external harmony... And on and on it goes! If someone's primary motivation is to learn how to be more violent, then I don't recommend martial arts to them (I'd actually recommend - with no negative judgment towards these things - things like therapy and medication...). That said, I do have an appreciation for people who want, or need, to learn how protect themselves and others (e.g. particularly military and police -- but also everyone else, too -- see Reason #4 above). Right or wrong, I also have a great appreciation for watching modern martial arts in the form of the Ultimate Fighting Championships (or boxing, or kickboxing, or Olympic wrestling, etc.). "Mixed martal arts" (e.g. UFC), in particular (and this modern, transdisciplinary approach to martial arts and competitive fighting) has been, simply put, revolutionary. I have great respect for the amazing martial artists and athletes these competitors have honed themselves into. I am not saying I don't have "mixed feelings" about watching mixed martial arts (and I would never push anyone to watch them). But there is some level of honesty (albeit a form of brutal honesty) when two people have agreed duke it out with rules and weight classes - to try to make it as competitive and fair as possible. The idea of martial artists from completely different schools, from different countries, all getting together and competing and sharing best practices is almost unprecedented [although some "proto" arrangements like this could be argued to have happened in some senses throughout history - I won't go into those here...]. This mixed approach may be revolutionary, but I am still left wondering, "Does general 'mixed martial arts' training help forge better people?" Does it even forge the best martial artists? By and large, the mixed martial art fighters I have most admired are those who acknowledge that their original practice of a traditional martial art changed their lives for the better. It gave them a path, discipline, and tools that could be used inside and outside of the ring/octagon. Then, to be able compete in the UFC (or other organization), which is a mixed martial arts milieu, they broadened their skills and perspectives and cross-trained, so that they were able to bring their "mother art" to bear on the unique and diverse set of problems (which are arguably different than those in self-defence) that "the octagon" presents. In medical rehabilitation school, I watched a professor intellectually eviscerate a student who, when asked what approach she used to treat clients had tried to evade the question by saying simply, "eclectic". The professor then painstakingly drove home the logic that supposedly using a "mixed" or "eclectic" or "multidisciplinary" approach actually requires that someone first be rooted in a few true, deep approaches so that then they can be able to branch out and compare and contrast with others. That is, one can only be multi-disciplinary or transdisciplinary or eclectic or mixed if they have first developed confidence within their own core discipline(s). As much as I believe in science, evolution, the lessons of history, and learning from real people who have "been there, done that" - I also just find Xinyi deeply aesthetically pleasing. Students have learned moves and made comments such as, "Oh my God! This move is amazing! Now I realize/see/feel that some of those beautiful moves from wushu cinema actually came from real, functional movements!" As Xinyi emulates various animal movements, I regularly enjoy referring back to watching how actual animals move. Although I am far less surrounded by animals and nature than martial artists may have been hundreds of years ago, I do have the luxury of being able to almost instantly access footage of animals-in-movement on the internet and also to be able to read behavioural and scientific analysis of how animals behave and live. I know that "beauty is in the eye of the beholder", but throughout most of recorded history, most cultures have admired the beauty, grace, and power of animals. Even the most modern of sports teams, military units, and national symbols often reference an animal imagery for inspiration (e.g. the "Chicago Bears", the "Flying Tigers", the "American Eagle", etc. Again, I could write extended expositions pondering the beauty of animals, what we can learn from animals, the animal aspects of our nature, what makes us uniquely human, etc... There is no end to these sorts of questions and thought experiments - which is great - because one of the most beautiful things about doing an art like Xinyi is that it is endless. Genuinely practicing art - any genuine art - is to join a conversation that has been going on for as long as humans have been creating art and which will continue on as long as humans keep trying to figure out their place in the universe. Although the physical development of raw strength inevitably peaks and then gradually falls away, the ongoing development of deeper internal knowledge, mental calm, and aspirations towards the best and most beautiful expressions of art can continue as long as one is still able to live one's practice. Even as the body gradually diminishes, the mind and "spirit" [I am not going down the rabbit-hole of trying to define "spirit" here...] can continue to be both expanded and refined. The art can be shared with others. The art's beauty lives on. It touches us and we do our best to be true to it, while adding our own touches. So, for all those out there practicing martial arts - or "gong fu" in any of its potentially infinite manifestations - all good things to you in your practice! For the past two years I have had a great gig, where every Saturday morning I go and chop wood for a couple of hours. For a long time, I had wanted to chop wood to supplement my martial arts training. More recently, many people older than I am have approached me while I chop wood - and told me that seeing me brings back memories of their younger years growing up on farms or in the country... I even had one intriguing gentleman come and tell me that he used to live in a monastery, in a silent Christian order, and that chopping wood was one of his regular duties. When he showed me the scar above his eye from a piece of wood that once flew up and hit him, I would like to say that I rushed out and bought safety goggles right away... Of course, I only bought safety goggles (and now wear them "religiously"!) after I, myself, had a piece of wood fly up and almost hit me in the eye! As much as I always swear to learn from the words of my elders - sometimes there is no teacher like experience (e.g. the experience of a flying chunk of wood to the head...). Of course, I chop wood for exercise. I get to do it a few hours a week, for pleasure and fitness. If I had to chop wood every day, all day, I have a feeling I would view it as "work", instead of as "play". I may even dread the drudgery and the exhaustion it might bring. I feel very fortunate to be able to choose this physical activity as a meaningful part of my life. What a privilege! And, while chopping wood, a few people have come and told me something similar: "You should get a hydraulic wood-splitter", I was instructed by more than one man. I just smiled and shrugged. Really? I wondered to myself - then what would become of me?? I am the wood-splitter. So why practice a centuries old martial art like Xinyiliuhequan? For me, it has been about connecting. It has been connecting with great teachers and great training partners. It has been connecting with the past. It has been connecting across the globe, across cultures, across languages, across religions, across generations... It has been about learning history in a very hands-on way. It has been about experiencing evolution - touching what has worked and survived and endured for hundreds of years. And, it continues to be both hard work and fun. 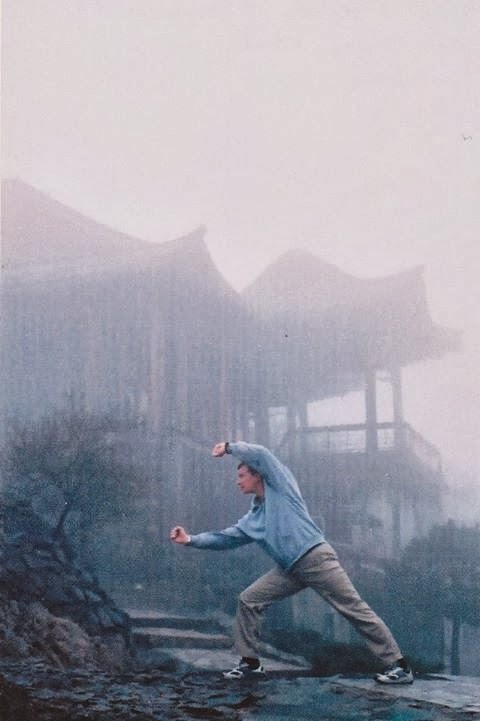 I remember in Shanghai on one of my first visits in 2003, Grandmaster Yu Hua Long watched me do a move I had been working on for years - and his face lit up with joy as he and I both connected -- as we both truly realized -- that a young man from Canada and an old man from China were both so dedicated to this art and doing our best to keep it alive and present and relevant. He grabbed me and hugged me so hard! We hugged while hopping in a little circle, on the little floor space that there was, in his little room. And, we both wore huge smiles - and there was something timeless and all-embracing about it all. So, for a few hours each week, I chop wood. And, for a few hours each week I keep practicing Xinyi. And, I am trying to find more people to share it with. The wood isn't going to chop itself and the Xinyi isn't going to practice itself. And, maybe neither act would be considered the most "efficient" use of my time. But I am not going to give up on either practice, "old fashioned" as they may be. I am going to keep trying to refine my Xinyi practice and use it to survive and thrive the best I can in the modern world. I am grateful I have had such opportunities. These types of practices continually add meaning to my life.